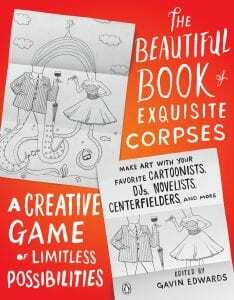 Gavin Edwards, editor of The Beautiful Book of Exquisite Corpses will be visiting Ross Gallery on Central Campus on Wednesday October 31, 2018 from 11:00am to 1:00pm. Accompanying Edwards will be local artists and book contributors Dustin Harbin and Holly Keogh. Be sure to stop by as the first 200 visitors will receive a FREE copy of the book! Click here for an article from Charlotte Magazine about the concept and contributors behind The Beautiful Book of Exquisite Corpses. This entry was posted in Ross Gallery, Special Event by Renee Cloud. Bookmark the permalink.